January 12, 2015 January 12, 2015 Pilar B. 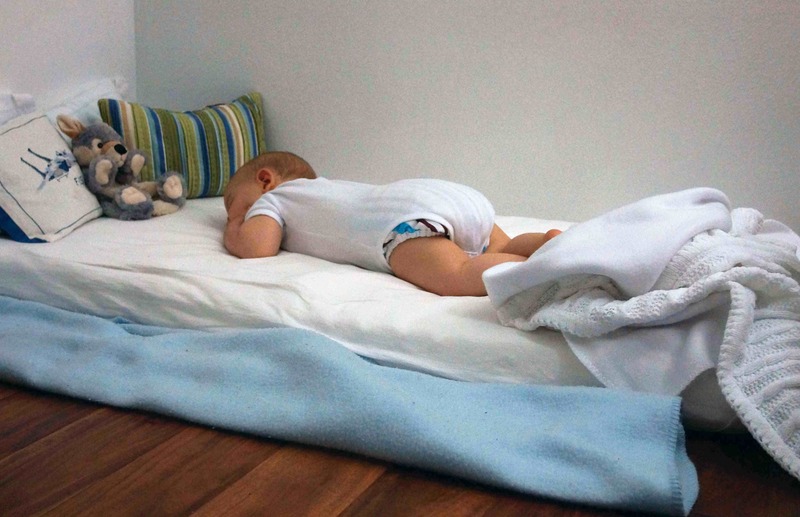 It seems like there are two major complaints when it comes to using a floor bed: the baby rolls off while sleeping and/or the baby crawls off to explore the room instead of staying put and falling asleep. I’ve experienced both situations, and I hope that I can provide some encouragement and realistic expectations for parents going through the same scenarios. Because the truth is, when used correctly, the floor bed is an amazing tool for supporting your child’s development, both mental and physical. Before we get to the solutions, let’s discuss the main purposes of the floor bed: encouraging independence, allowing the development of the child’s will, and supporting their need for movement. A child on a floor bed can get in and out on her own as soon as she can slither, thereby reducing her dependence on adults and increasing her sense of self-reliance. This experience supports the development of the will, wherein the child formulates a goal, tries different strategies, accomplishes her mission, and feels successful. And all the while, her need for free movement is being supported, because she can use each skill (focusing her eyes, rolling, slithering, crawling) as soon as she develops it. Like any other Montessori developmental aid (including mobiles, weaning table & chair, and every single Montessori material), it is important to introduce the floor bed at the right time. Failure to do so can result in reduced effectiveness and increased frustration for both parent and child. The best time to introduce the floor bed is a few weeks after birth. At first, the newborn should sleep in a bassinet that allows unobstructed views of her surroundings. However, around the time that recognizable sleep patterns are established and before the child is rolling, she should transition to the floor bed. Each child and each family is different; you can read about how I transitioned my son from the bassinet in our room to the floor bed in his room here. Transitioning your child at the right time doesn’t mean that you won’t encounter challenges. Once your baby starts rolling, chances are she’ll probably roll off the floor bed at some point. This seems like a bad thing, but consider it from your child’s viewpoint: she’s free to move and practice her new skill; she’s developing an awareness of borders (which will come in handy when she navigates stairs and transitions to a “big kid bed”); and she’s experiencing the consequences of moving past those borders. Many families find that a soft rug or blanket placed just next to the floor bed is all that’s needed to cushion the baby’s “fall” (which in reality is not more than a few inches). Some parents find that they can gently move their baby back to the bed without waking them, while others (like me) prefer to let the baby snooze on the floor. 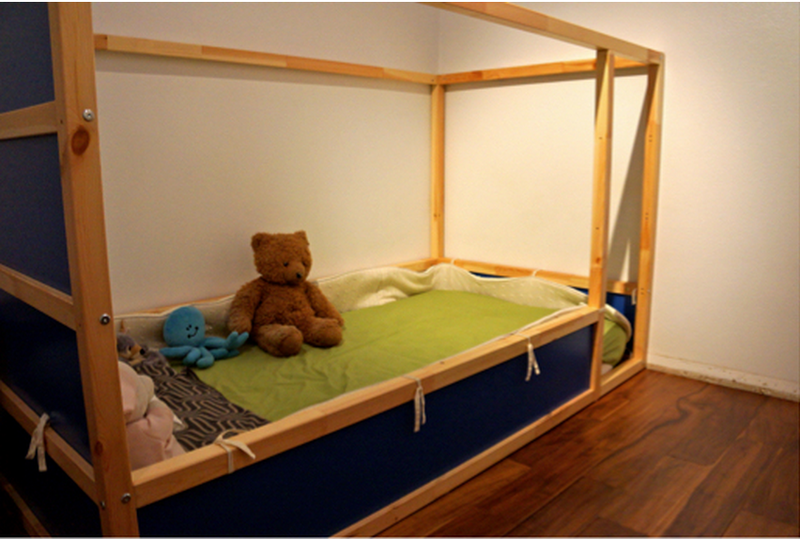 If your child is particularly active while sleeping (like mine is), and she’s at the stage where she’s able to slither on and off her mattress at will, you can also try placing a rolled towel at the edge of the bed under the fitted sheet, or investing in the wonderful IKEA Kura loft bed (minus the slats, so the mattress rests on the floor). This set-up won’t hinder a child’s independence as long as you show her how to get in and out, and will provide the support they need to stay on the mattress. The more stressful challenge to parents is when the child starts slithering and decides to move off the bed to explore her room, instead of staying in bed and falling asleep. While frustrating to adults, we must remember that this is exactly what the floor bed is designed to do – encourage independence and develop the will. You can read here about what happened when we decided to follow our child’s lead. The best piece of advice I can give parents who are going through this phase is to keep their child’s room as sparse as possible. On the shelves the child can reach, place only a few carefully selected items for her to explore and leave them there, always in the same order. Don’t make the bedroom her activity or play area or feature lots of new and interesting objects at her eye-level, because this will encourage her to get out of bed and go see what’s new. She will certainly crawl out when she first develops the ability to do so, but once the novelty fades, if there’s nothing new for her to explore in her room she’ll be more interested in resting (because all that slithering and crawling is exhausting!). 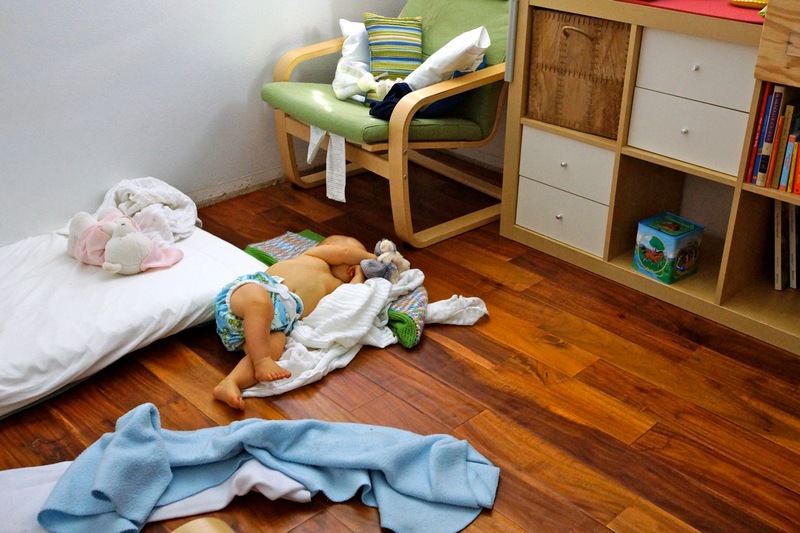 Many parents make the transition from crib to a floor bed after the child is slithering or crawling, expect them to just stay put and fall asleep, and feel frustrated when this doesn’t happen. When a young child is given freedom, she’ll use it to further her development. She can’t not. It’s an evolutionary mandate. If you’ve chosen to give your child the freedom to move, then you can’t be angry at them when they take full advantage of it! Be patient, provide a predictable routine and clear expectations, and gently re-direct back to the bed as many times as necessary each evening. I assure you that with consistency and realistic expectations will come success, and your child will reap the long-term benefits of the floor bed! 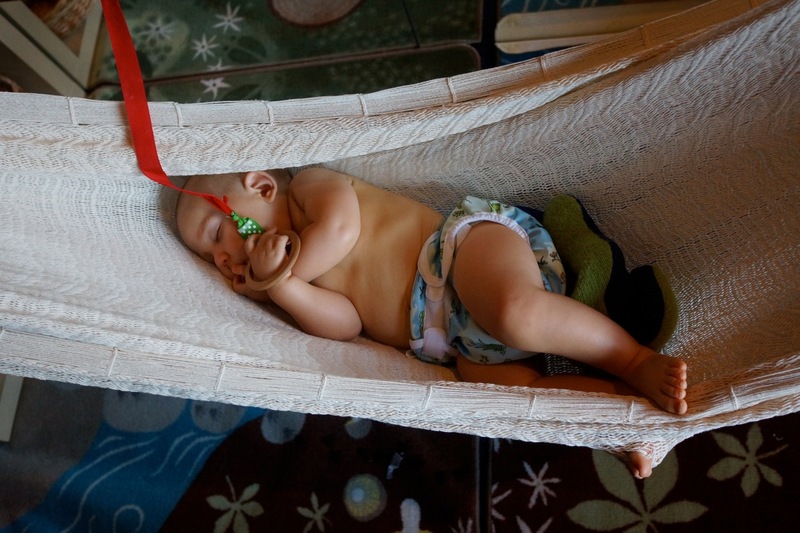 November 10, 2013 Pilar B.
Zachary on his floor bed at 5 months of age. 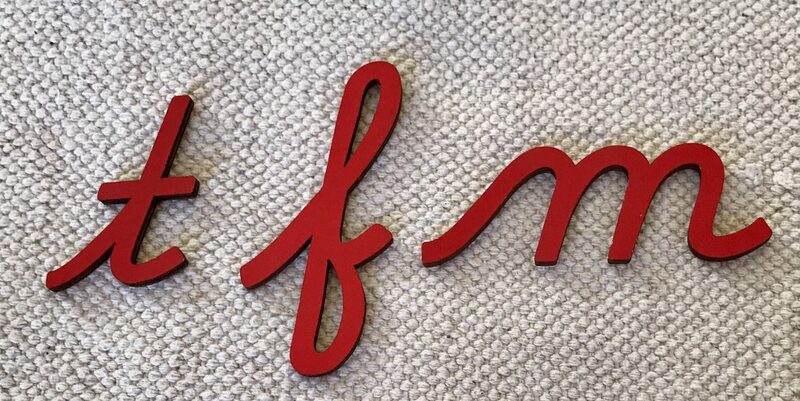 I’ve been getting a few questions about floor beds, so I thought I’d do a quick round-up of what I’ve written so far and share my experiences… Hope someone finds it helpful! August 21, 2012 Pilar B. 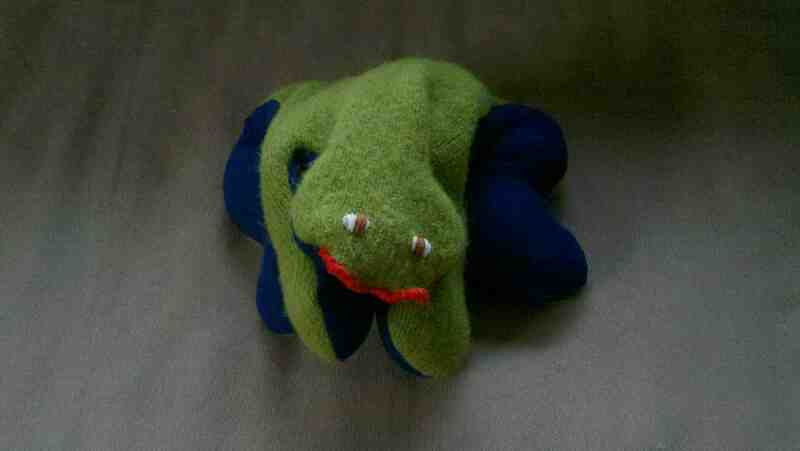 When my husband’s younger sister was a baby, she received as a gift a cloth frog that could assume endless poses due to its birdseed innards. Over thirty years later, the frog – named “Bleh” – still lives in my in-laws’ basement. We recently received Bleh in the mail with a request that I clone it, since the poor amphibian is losing its stuffing through tiny holes in its fabric. Using an old pair of yoga pants and a felted green wool sweater, I whipped up Bleh the Second in two nap times and a swim lesson. 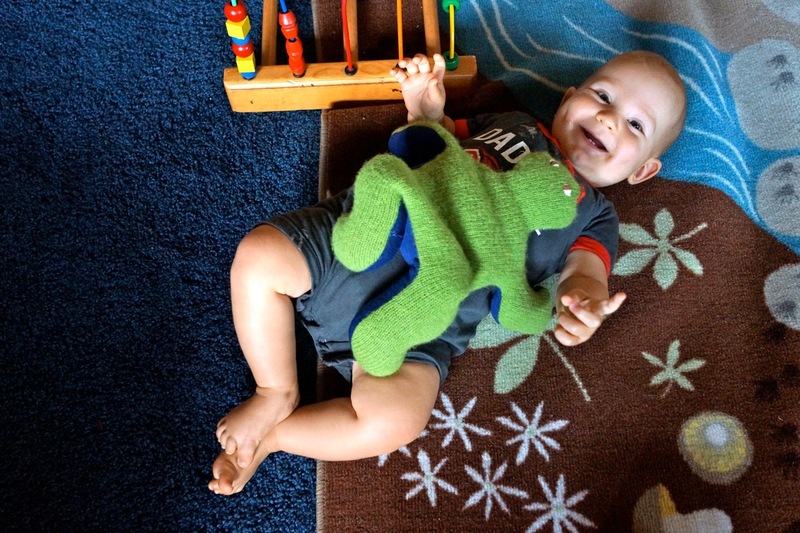 Zach cracks up every time he looks at the frog… Wouldn’t you? August 19, 2012 September 9, 2012 Pilar B. This week, Zach came to the exciting realization that he could transport himself across a room. Using a combination of army crawling, slithering, and rolling, he covers the span of his bedroom in mere seconds. His new-found ability has made me appreciate the genius of the floor bed even more, but it has also reminded me that nature is in charge here, not me. Yesterday we had to go to L.A. for the first half of the day, so poor Zach basically spent 5 hours in a car seat (mostly asleep). Needless to say, by his 7pm bedtime he was just not tired. I tried to put him to bed as usual to see if he would get sleepy, but instead he threw a fit. After I tried to calm him down a couple of times, my husband decided to go hang out with him. He didn’t really interact with him or even turn on the light in his room; he just laid down by Zach’s bed and observed him. This calmed Zach and he decided that he wanted to go exploring for a while. He wriggled off his bed and made his way across the room; for almost an hour he babbled to himself while happily trashing his room investigating the contents of his cubbies. I observed all this from the hallway and when I saw that he began to show indications of being tired (rubbing his eyes and yawning), we told him it was time to sleep, put him back on his floor bed, and left the room. He didn’t utter a peep and slept through the night. Today, he went to the pool with my husband and came back an hour after the “official” start of his nap time (he’s usually up for two hours before needing a nap). I fed him lunch and put him in bed, but since he was over-tired he became hyperactive and didn’t want to sleep. I heard him rolling around in his room and pulling out his toys. He played for about 30 minutes on his own, and then another 10 with me when I went into his room to see if he was getting tired. I eventually noticed signs of sleepiness, so I changed his diaper and put him back onto his bed. He again fell asleep without a single complaint. In a nutshell, the floor bed helps the child independently move at will. Isn’t it amazing to think that a simple mattress on the floor can be such a POWERFUL tool for supporting a child’s development? August 6, 2012 Pilar B. In the past few weeks Zach has become an expert roller. Leave him alone for five minutes and he will end up halfway across the room. It’s great fun to see him rolling around, ambitiously exploring our house. One of my favorite moment of the day is when he wakes up from his naps and I hear him babbling happily in his room. I’ll peek in and he’ll be on his tummy, far from his bed, having a conversation with the leg of the nursing chair. As fun as his rolling is during the day, it is highly irritating at night. He sleeps on a floor bed, and at night he’ll roll off the bed while asleep. We hear a “thump“, followed by silence. Sometimes he’ll sleep on the floor for a while, so we leave him there as long as he seems comfortable (it’s been so hot that I think he actually enjoys sleeping on the cool wood floor). For the most part, though, after the thump comes some muttering, and then a plaintive wail for help. He doesn’t cry, but lets out a very distinct “aaaaaaaahhhh!” that clearly means “Come put me back in my bed!” This happens two or three times a night… It’s no fun having a baby who “sleeps through the night” if you have to wake up three times a night to plop him back on his mattress! A resourceful friend to whom this was also occurring came up with the idea of sliding a rolled towel under the long edge of the bed that’s not up against the wall. We tried it last night and, wouldn’t you know it, Zach slept through the night (and so did we!!). The beauty of this solution is that he can still roll out of bed when he’s awake, which is one of the main reasons for using the floor bed. Our son can still enjoy his independence during the day, but has just the right amount of support to prevent night rolling. Once he’s able to crawl, we’ll remove the rolled-up towel. Then we’ll let him roll out of the bed and encourage him to crawl back on if he wants to. What challenges have you encountered while using the floor bed? How have you modified the environment to support your child’s needs?